Look, instead of listening to Sandy Claws over there, try listening to me. All I'm saying is the big guy has gotten a little too big for his britches, in more ways than one. Christmas isn't about gifts, I should know that as well as anyone. The whole point of this holiday is to celebrate being together and caring for other people. All that human Kool-Aid man has done for this holiday is take what matters most and twist it. Not only does he take all the credit from hard-working parents who work tirelessly to make their families happy, but the very culture of surveillance and behavioral policing is unhealthy, especially for the kids. To start, a creepy cis-het white dude breaking into houses is not a good idea to advertise to kids. The idea that someone else is responsible for ensuring the happiness of children around the world is taking away from the real heroes of this holiday: parents, especially since Santa is all show and doesn't actually buy the gifts. Many parents simply can't afford to be the same "Santa" that others can. Parents struggle to afford the gifts their kids want. So, when kids show off the fancy-smancy gifts "Santa" gave them for Christmas, it causes other kids to think Santa doesn't like them as much. The whole point of Santa is to make kids happy, but the unfortunate truth is not everyone can afford to recreate the Santa myth. 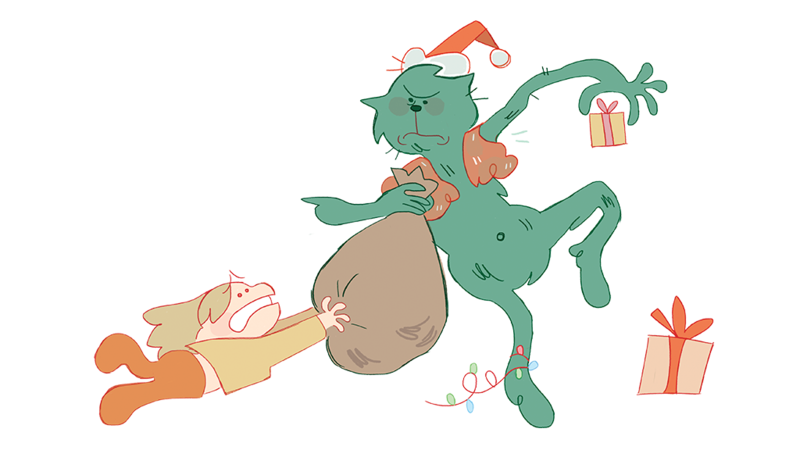 It can be nice to think a magical entity gives you presents instead of your parents, but all it does is take away the glory from all the work parents do to make their kids happy. "The unfortunate truth is not everyone can afford to recreate the Santa myth." Again, it's a little creepy to have some old dude watching over everything kids do to make sure they're not "naughty." This idea of constant surveillance and an absolute reward or punishment system is detracting even more from the idea of Christmas as a holiday and more of childhood annual review. Not to mention if parents can't manage to pull together enough for a decent Santa bounty, kids will think they behaved awful, regardless of how evil the little gremlins actually were. If Santa was truly worthy of goodwill and cheer, he would use his mass-distributing resources to provide gifts on an equal scale. My heart isn't as small as you think. The magic of Christmas is not lost on kids if they know the old geezer up North is a myth. Kids love to play pretend, no matter how much they know it isn't real. They can still enjoy writing letters, visiting some random guy in the mall to tell him their greatest wishes, and leaving out milk and cookies. The real part of Christmas that matters is the spirit of giving that is within all of us, not one literal spirit of giving. I know better than most that lying never ends up well, it always leaves you with a little ache in your heart; and in the end, it adds more pain than necessary to what should be the most wonderful time of the year.